Gotta Love It: Another Raven Bites The Dust | "IT'S A STEELERS WORLD"! Normally I have never been the type of person to take pride in another person’s misfortunes. But when it’s a player from one of the NFL teams that I despise the most I not only take pride in it, I am the first in line to rub salt in the wound. The Baltimore Ravens announced they’ve released running back Bernard Pierce, who was arrested early Wednesday morning and charged with driving under the influence of alcohol. Pierce, 23, played three seasons for Baltimore, averaging 3.8 yards per carry and rushing for five total touchdowns. Would I find this to be good news if it was a Steelers player involved in such a fiasco? Of course not. But it wasn’t so I find it to be great news for other teams in the AFC North, because the last I checked..”IT’S A STEELERS WORLD”..not the Ravens’. Pierce was the third Ravens player arrested and then quickly released this off season, which makes them an NFL organization that has now produced more criminals this off season than Super Bowl titles. According to Baltimore County police, Pierce failed field sobriety tests after getting pulled over for speeding. 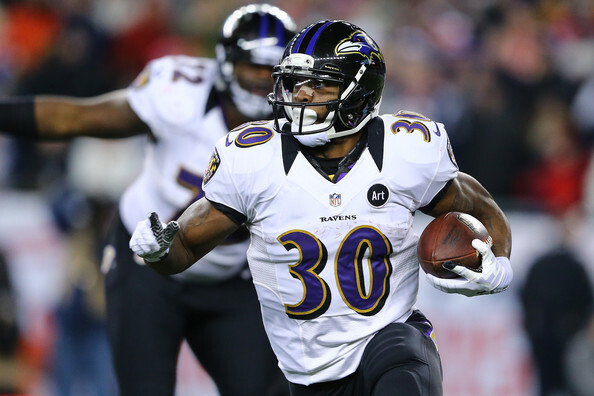 The Ravens will enter 2015 with Justin Forsett and Lorenzo Taliaferro as their top two running backs. Usually a simple DUI is normally something some people may consider to be “no big news”, but when it involves a somewhat celebrity in the public’s eye..it becomes “big news” to me. Especially in this situation because it’s just another rich, spoiled athlete that didn’t take into consideration of the damage he could have caused due to his actions.